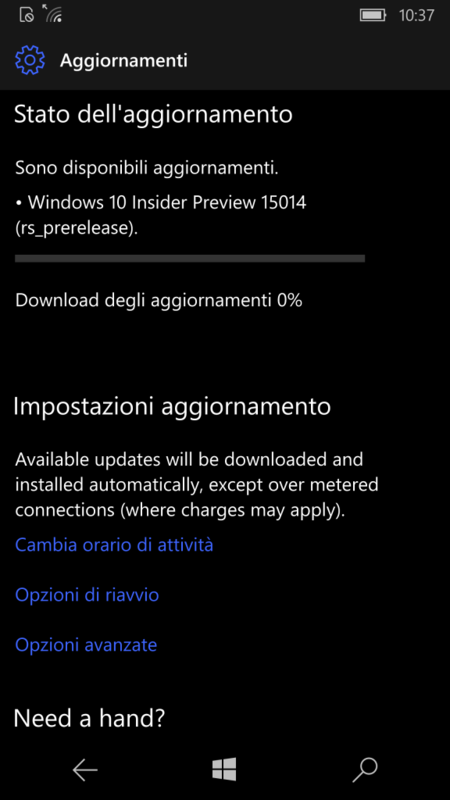 Questa settimana la nuova Insider Build Preview di Windows 10 (Redstone 2) è numerata 15014, e come la precedente è disponibile al download per PC, tablet e smartphone attraverso il canale di aggiornamento Fast Ring. Nota: a causa di un problema tecnico su Windows Update, sui PC l’indicatore di avanzamento del download della build in oggetto potrebbe rimanere allo 0% per lungo tempo. Non preoccupatevene perchè si tratta di una indicazione non corretta, e il download andrà a buon fine. Solo per gli utenti USA (proprio come avevamo anticipato in questo articolo) lo Store permette il download di e-books da leggere attraverso Microsoft Edge. 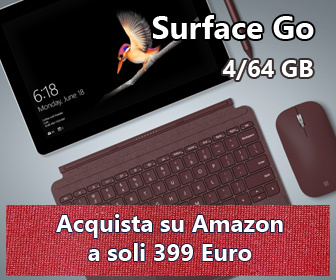 Questa novità è disponibile sia su PC sia su smartphone. Rimossa la funzione “Angolo delle App” a causa di un utilizzo molto basso da parte degli utenti. Aggiunta una nuova opzione per la personalizzazione del colore di sistema per permettere all’utente di scegliere la tonalità di colore desiderata. Come è possibile vedere in questa immagine, si disporrà di un selettore e del campo per l’inserimento manuale del codice esadecimale del colore che si preferisce (solo su PC). Nelle Impostazioni è stata aggiunta una nuova opzione che permette di liberare spazio automaticamente dalla memoria del dispositivo e di sbarazzarsi di file non necessari. La pulizia agirà sui file temporanei e su quelli del cestino più vecchi di 30 giorni (solo su PC). Tutte le impostazioni relative al Wifi ora sono raggruppate sotto la voce “Servizi Wifi“. Questo cambiamento vale sia su PC sia su smartphone. Su alcuni PC, il popup relativo alle info della batteria che appare con un click sull’icona della batteria nella Barra di sistema ora ha un’interfaccia modificata (vedi questa immagine) e più avanti mostrerà più opzioni per permettere all’utente una più rapida personalizzazione della configurazione di sistema relativa al risparmio energetico e all’efficienza delle prestazioni del PC. Migliorata la velocità di visualizzazione di immagini HTTP sulle live tiles (per esempio, quelle usate da MSN Notizie per le anteprime delle news nella live tile). You may see the Mail app pinned to your Taskbar after updating to Build 15014. The Mail app is now pinned by default to the Taskbar starting with the Windows 10 Creators Update. If you unpin the Mail app after this change, it will not return. ADDED: If you have Outlook 2016 (or previous Outlook releases), Yahoo! Mail, or TouchMail pinned to your taskbar – the Mail app won’t get pinned. We’ve fixed an issue resulting in the “Working on updates” screen unexpectedly showing a box instead of a progress wheel for some Insiders. We fixed an issue where Desktop shortcuts containing the “%” character (usually URI shortcuts with escaped characters) would result in an Explorer.exe crash loop. We fixed an issue where projecting to a secondary monitor could result in an Explorer.exe crash loop. We fixed an issue where using CTRL + C to copy in Command Prompt wasn’t working. We’ve made some polish adjustments to the Background Settings and Printers & Scanners Settings pages. We fixed an issue in our new Out-Of-Box-Experience (OOBE) where clicking “Skip this step” on the Microsoft Account creation page would unexpectedly loop back to “Who owns this PC?”. We fixed a translation issue in the Start menu for those using the Catalan display language – newly installed apps will now show “nou” next to them. We fixed an issue where the list of apps in the Surface Dial “Add an app” page via Settings > Devices > Wheel might unexpectedly be empty. We fixed an issue where Miracast wasn’t working on recent builds. We fixed an issue where if a second notification comes in after dismissing a first notification and immediately opening the Action Center, that notification toast would show on top of the Action Center, rather than within it. We also fixed an issue that could result in sometimes seeing unexpected space at the top of the Action Center. We fixed a deadlock from recent Insider builds that could result in the Action Center appearing blank. We’ve adjusted our Action Center icon animation logic, so you will now no longer see the same app logo flash multiple times in quick succession after you first log in if many notifications have been received since last logging in. We fixed an issue where refreshing a PDF displayed in Microsoft Edge would result in a blank page and you would need to refresh it a second time for the PDF to appear. We’ve updated the alignment of the VPN connect button in the Network flyout to be right-justified and fixed an issue where it was unexpectedly displaying a grey border. We fixed an issue where brightness changes made via Settings > System > Display would unexpectedly revert after closing the Settings app. We updated the WIN+X flyout to say “Apps and Features” instead of “Programs and Features”. We’ve polished the animation when dropping a tile onto another tile in Start in order to create a folder. We fixed an issue where, if the User Account Control (UAC) settings were set to “do not dim my desktop”, running something from File Explorer as Admin could result in UAC displaying behind File Explorer. We fixed a capitalization issue in the “Open PowerShell here” context menu entry when you Shift + Right Click File Explorer whitespace. We fixed an issue for Insiders where customized desktop icon layouts were lost after rebooting. We also fixed an issue where when desktop icons were set to auto-arrange with a docked device and multiple monitors, undocking and docking the device could result in an unexpected desktop icon layout. We’ve updated the system tray logic to be more robust when faced with bad data that could potentially result in Explorer.exe reliability issues. We fixed an issue where 3rd party UWP apps would crash on devices if the DPI settings on the machine are >=150%. We fixed an issue where if you were to upgrade from Windows 8.1 directly to recent Insider Fast builds, all your Store apps would have been lost during the upgrade process. I problemi noti di questa nuova Build Preview sono diversi, sia per PC sia per smartphone. Per l’elenco vi invitiamo ad accedere a questo post del Windows Blog. Se siete iscritti al Windows Insider Program e avete attivato la ricezione delle Build Preview via Fast Ring vi basterà accedere a Windows Update (su PC) o in Impostazioni, Aggiornamenti e Sicurezza (su smartphone) e ricercare manualmente la presenza della nuova Build. Elenco degli smartphone abilitati ad installare questa nuova Build Preview: Alcatel OneTouch Fierce XL, BLU Win HD LTE x150e, BLU Win HD W510U, BLU Win HD LTE X150Q, BLU Win JR x130e, Funker W5.5, Mouse Computer Madosma Q501, Xiaomi Mi4 e sui Lumia 430, 435, 532, 535, 540, 550, 635 (1 GB), 636 (1 GB), 638 (1 GB), 640, 640 XL, 650, 730, 735, 830, 930, 950, 950 XL e 1520. Per chi la installa funziona bene su un telefono da usare tutti i giorni oppure é molto instabile con tanti bug??? sempre usato solo il tel principale e ho messo su di tutto. Concordo come si risolve il problema con il 650? Ho un lumia 950, è stabile questa build!? Grazie! Tornato stabilissimo ! Solo WhatsApp ogni tanto scazza ! Solo io con 950xl ho problemi con l’aggiornamento di “sveglia e orologio” o capita anche a qualcun altro? Se si come avete risolto? 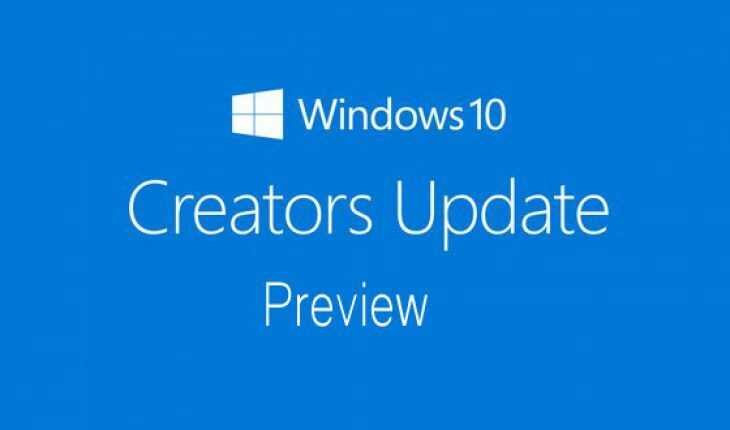 Scusate…ma quando arrivera l’aggiornamento ufficiale (stabile per non insider) di Creators Update, si deve fare il back up..? o non centra nula. Chiedo per paura di non perdere i dati…app e giochi quando si instala l’aggiornamento di OS…. Un aiuto grazie, non riesco a far installare questa build su pc fino alla 15007 é andato sempre tutto ok, adesso carica la 15014 poi si riavvia ma quando ritorna windows mi dice che non ha aggiornato senza nessuna motovazione.